Drug Concentration standardization represents a core set of actions that protect patients and should focus on developing the fewest number of drug concentrations to provide safe clinical care. Reduction of variance in concentrations in an effort to decrease medication errors is the goal of the medication standardization effort. As leaders in the perioperative environment, physician anesthesiologists have a unique role in decreasing the risk of a patient experiencing adverse medication events. Standardization may include a limited, set of concentrations for medications that have been labeled as high-alert or known to have produced a significant number of adverse events. Local facilities may seek to harmonize such concentrations with pharmacy services and other stakeholders and within their drug libraries and balance the objective of reducing the risk of patient harm with pragmatic considerations, such as strength and quality of evidence, feasibility and economic burden. With the efforts of drug concentration standardization, federal agencies, manufacturers and other stakeholders should be vigilant and protect against drug shortages that may emerge from but not be limited to pharmaceutical company consolidation, vulnerable supply chains, key supplies of drugs being limited to a single manufacturer with a lack of back-up production, and reliance on a single production facility. 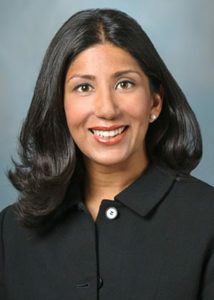 Dr. Elizabeth Rebello is Associate Professor in the Department of Anesthesiology and Perioperative Medicine (DAPM) at the University of Texas MD Anderson Cancer Center. In her institution, she serves as chair of the DAPM faculty mentoring committee and serves on the Pharmacy and Therapeutics, Faculty Mentoring Advisory, Operations Steering, and Molecular Testing Evaluation Committees. She serves as the chair of the American Society of Anesthesiologists’ (ASA) Committee on Professional Diversity and ASA Education Track for Professional Issues, and leads the Medication Safety Workgroup under the ASA Quality, Management and Data Administration Committee. She is a pharmacist and also serves as an expert consultant to the United States Pharmacopeia Expert Compounding Committee.